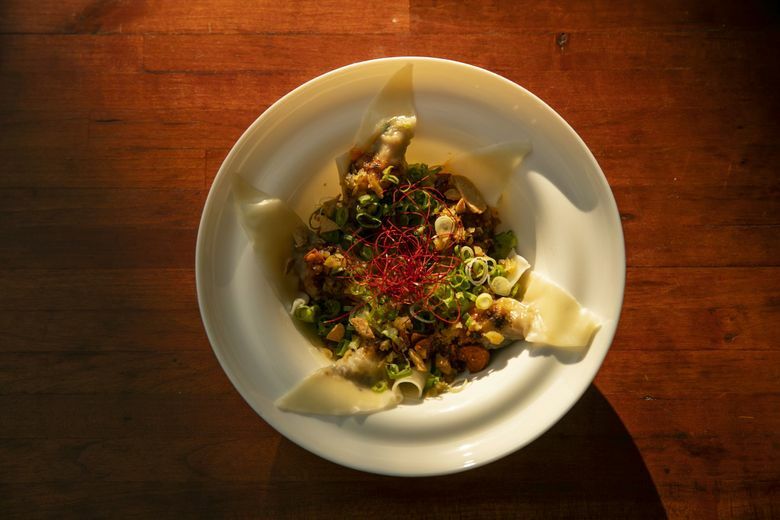 Restaurant critic Providence Cicero calls Tamari Bar "anime come to life." From the staff's enthusiasm to the Instagram-worthy dishes, it's a fun spot to hang out. Last February, Tamari Bar settled into the corner of Summit Avenue and East Pine once occupied by World of Beers, continuing an urban renewal of sorts. The rowdy good times that made the Pike/Pine corridor infamous aren’t gone, they just got fizzier. Think bubbling whisky highballs, strips of wagyu beef sizzling on a hot stone, and sashimi that sashays down a spiral staircase amid a cloud of dry ice. Tamari Bar is like anime come to life. A flat-screen mounted above the bar was looping actual anime on my visits, though they sometimes play food videos, too, and lately have been running “Lost in Translation,” the 2003 Sofia Coppola film set in Tokyo. Each time the door opens — a frequent occurrence — the entire staff barks irasshai, the imperative of the traditional Japanese welcome, as if they are commanding you to have fun. That’s not hard to do here. Those familiar with Suika will recognize the family resemblance in Tamari Bar’s brick, tile and concrete-block walls, the set pieces of mini Ultraman action figures and the many empty sake bottles decoratively re-purposed. It’s a big place, yet cozy and dim, with bi-level seating and sheltered sidewalk tables. The 20-somethings who gravitate here favor the highboys opposite the open kitchen, but there are regular tables near the bar and on the mezzanine. My preferred spot is in front of the sushi case, next to the pass, where you can eyeball everything the kitchen sends out, most of it looking like Instagram bait. When you finally put down the camera and dig in, there’s plenty to rave about. The set menu is a collection of small plates, sushi rolls, noodles and rice dishes, but the daily special sheet competes hard for attention. Printed in frenzied black-and-white graphics on copier paper, it looks like a flyer you’d see stapled to a utility pole in the neighborhood. One side calls out the bartender’s latest whimsies (more on that later). The flip side advertises whatever has struck the chef’s fancy that day. 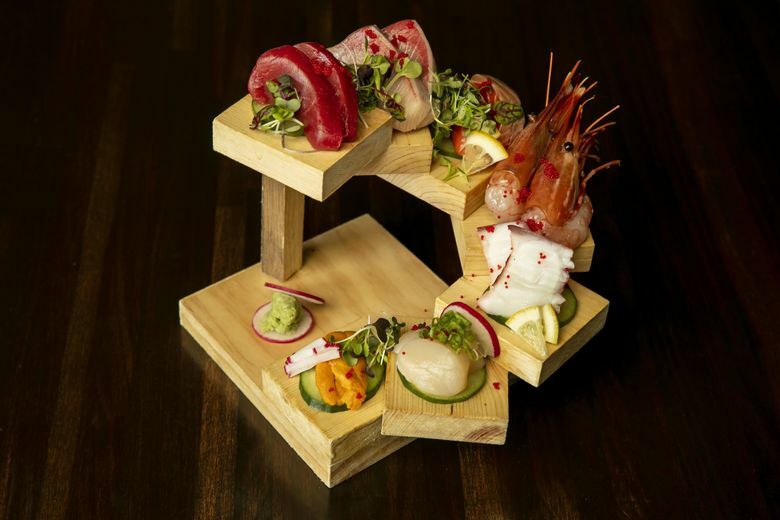 Perhaps nigiri sushi saddled with both wagyu and uni, each lightly seared, much to their benefit, or Canadian spot prawns, which were among the seven pristine sashimi items displayed on that spiral staircase. The special sheet also catalogs the daily contents of the nine-compartment bento box. This sampler of small bites is perfect for two if you want to share, but the supply is limited as the kitchen has only two dozen boxes. Our bento held nicely fried oysters and salmon croquettes, each dabbed with aioli; tuna escabeche; garlicky edamame; ikura-dotted kale and radish salad; raw slices of sockeye “carpaccio”; cooked duck “carpaccio” in soy vinaigrette; an all-white “shiro” shooter of grated white chocolate over cauliflower cream; and a chunk of aburi-style sushi roll loaded with several kinds of roe. Pork dumplings have been a fixture on the fresh sheet for a while. Those bite-size packages are sauced with a righteous housemade ra-yu. The potent chili oil is crisped with almonds, sesame, fried garlic and who knows what else. It’s a versatile condiment, used here with abandon. 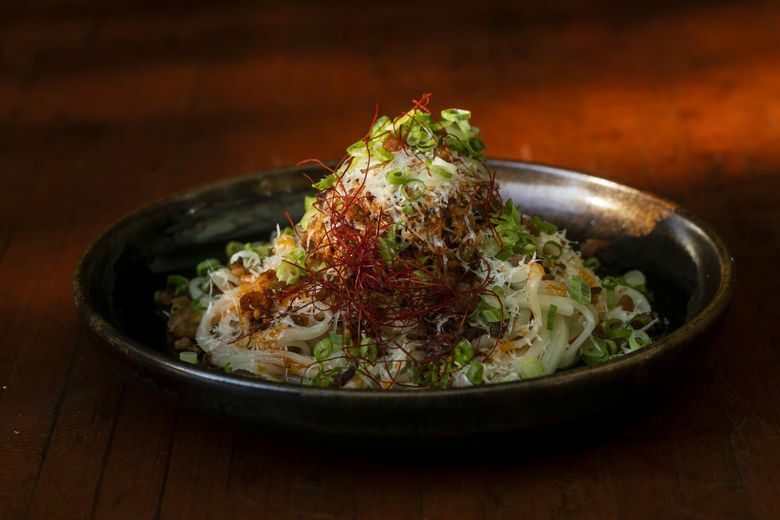 It puts the Asian in “Asian poutine.” It gins up the heat in “maze-men,” a bowl of pork-riddled, parmesan-dusted inaniwa udon noodles that tastes like some crazy, rich Asian Bolognese. A side of ra-yu boosted a dull “veggie roll” that contained just cucumber. If only there had been some on the mozzarella melting over pallid grilled cauliflower. The menu goes arm-in-arm with drinks. A few desserts even incorporate alcohol. Admirable “Tokyo tiramisu,” made with mascarpone and castella (Japanese sponge cake), was spiked with Carpano Antica vermouth. Crème brûlée was infused with sake lees, giving the silky custard more complexity than most. If sake is your preferred beverage, several styles are available by the glass, pitcher or bottle. 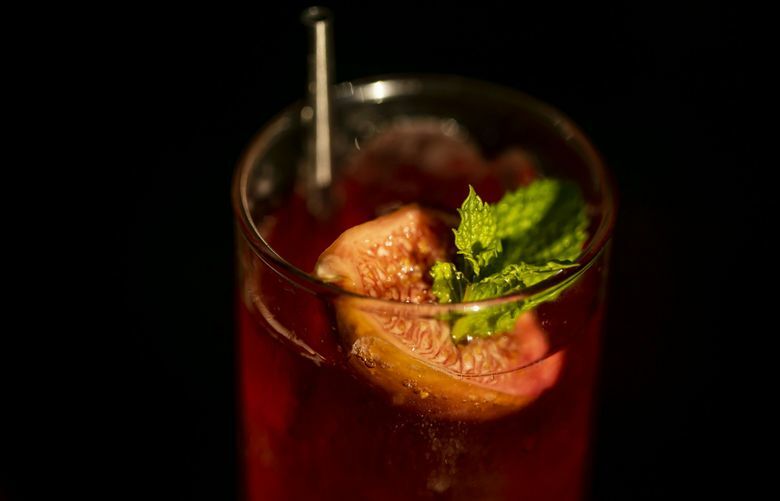 If partying is the goal, they’ve got you covered with all kinds of prettily garnished concoctions, some more outlandish than others. 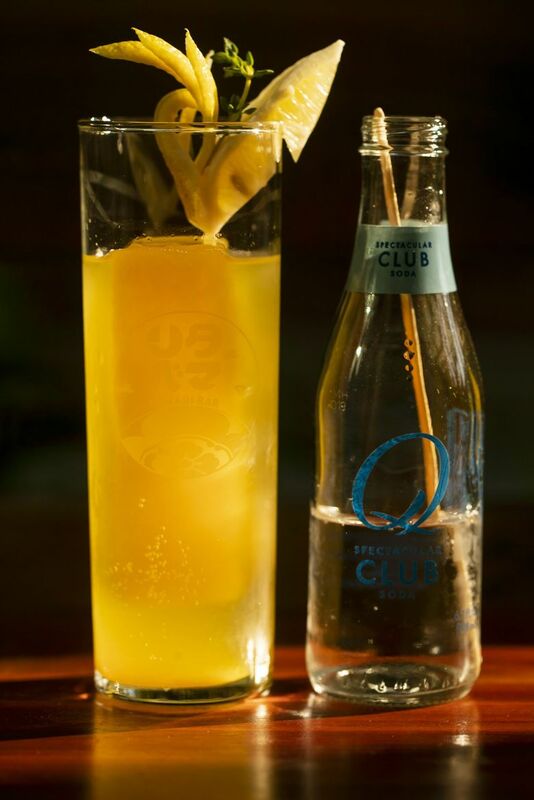 A summer special called “Otona No Melon” involved gin, vodka and cantaloupe sorbet infused with sake and St. Germain. “Hola!! Geisha,” a kind of mezcal margarita, delivered smoke and fruit across a matcha-salted rim. Rye and ginger merge in the smooth, spicy “500 Fashioned.” The house ginger syrup also makes a killer, zero-proof yuzu-infused ginger ale. Tamari Bar recently acquired a Suntory Toki highball machine, said to produce a precisely calibrated and chilled whisky-and-soda highball that bubbles like champagne. Things are about to get even fizzier on East Pine.